Stewart Friesen stepped onto the winner’s podium at the New York State Fairgrounds last Sunday, taking the checkered flag after 200 laps in a big block modified. He was the last person who ever would. They’re tearing down the mile track at Syracuse, and no one is happy about it. There are only five mile-long dirt tracks that run auto races left in the U.S. All of them were originally built as horse tracks, and all of them are at state fairgrounds: DuQuoin, Indianapolis, Springfield, Sacramento (which hasn’t hosted an auto race in years), and Syracuse. One-mile dirt tracks are a part of American racing history, many of them built in the 19th century and opened to auto racing when the demise of the board tracks during the Depression forced USAC to sanction dirt races. The stragglers in the midwest are still regular tour stops for ARCA and the USAC Silver Crown cars (who showed up Saturday at Syracuse and tore off hot laps on a wet track as if they’d grown up there), but the legacy of the dirt superspeedway has eroded completely in the northeast. Langhorne was paved over in ‘65 and closed in ‘71, the same year Nazareth shut down (Roger Penske paved it in 1987). But Syracuse remained. In fact, racing promoter Glenn Donnelly ran the first Super DIRT Week in 1972 partly in response to Langhorne’s shuttering, which left northeast modifieds no major long-track event. He created a series of qualifier races at various short tracks throughout the season that fed into the Syracuse event, which evolved into a year-long points championship and sanctioning body called DIRT (Driver’s Independent Race Tracks). It’s hard to explain the allure of Super DIRT Week. A lot of it is that mile long track, of course. There’s nowhere else to see those 850 horsepower engines unwind all the way. Nowhere else big enough to allow infield pit stops. There’s a tension whenever cars are on the track at Syracuse, a hum of energy like a circuit has been completed between the engines, the drivers, the announcers, and the fans. An on-track incident is heralded by shouts echoing along the concrete and steel and aluminum of the grandstand, then the announcer’s voice escalating in pitch, barely audible above the engine roar. Someone points—maybe turn three, all but invisible behind a row of campers, or deep in turn one, just beyond the old pit exit point, and all heads turn in unison. Sometimes it’s just a car slowing with a flat tire. Sometimes it’s a scene of carnage, machines thrashing and destroying themselves in the dust, like this terrifying crash in 1987. The back stretch is narrow and becomes convulsed with deep ruts and pits as the grueling race grinds on. The souvenir program usually includes a famous photo of modifieds going four wide there in the late 70s, captioned simply, “They said it couldn’t be done.” It can be done, but most of the time it ends up like this qualifying wreck from this year that sent the videographer running for cover. Amazingly, and thankfully, no one’s ever been killed at Super DIRT Week. The track itself is so unique it makes everyone who races there an amateur. The most successful teams at Syracuse build cars just for this one race. None of the pit crews are used to doing hot pit stops mid-race, and a well-timed caution leads to utter chaos as cars slide into their pit stalls to be fueled by guys in cargo shorts and t-shirts. It was even worse before they instituted a pit road speed limit and moved the pit exit to the back stretch. The horse track in Syracuse was built in 1826, and the first auto race was run in 1903. Tony Bettenhausen, Mario Andretti, A.J. Foyt, and Al Unser all ran there. They call it the Moody Mile, ostensibly in deference to Wes Moody, the first man to turn a lap with a 100 mph average speed (in 1970). But anyone who’s gone to the track every October knows what an appropriate name it is—the early October weather shifts from chill-inducing rain to glorious t-shirt weather, and the track morphs from a silky surface with tons of bite to a rutted, dusty disaster in a single afternoon. The history of the big race is so rich I can only touch on it. The distance has changed from 100 laps to 188 (a loosely defined 300 kilometers) to 200. The original sponsor, Schaeffer Beer, only exists today as a hipster label put out by a giant beverage conglomerate. Buzzie Reutimann won the first two races, then Gary Balough had a string of victories in the late 70s. In 1980 Balough utterly dominated the event with “The Batmobile,” an aerodynamic freak that forced DIRT to rewrite the rulebook on body panels. In 1989 Alan Johnson won from last place—as I recall, he finished the consi in a dead heat with Dave Lape for the final qualifying position, and they were both allowed to start. The 90s were the Brett Hearn era. His unrivaled success (he won six races, three drivers have won four, no one won five) and association with national sponsors made him a natural villain. Brett the Jet became Brett the Corporate Jet, and he still gets lusty boos even today. The race is hell on equipment and worse on drivers. When you look at photos of Super DIRT Week winners, you see a complex mix of human emotion; undeniable joy and unbelievable weariness. Not every great moment at the Moody Mile was about the modifieds. This World of Outlaws sprint car duel between Steve Kinser and Jac Haudenschild stands in my mind as one of the greatest races ever driven. The highlights don’t do it justice. The New York State Fairgrounds sprawl around the race track, a tangle of horse barns, ag buildings, and food vendors. There are reserved camping spots with official water and electrical hookups filling the infield and a few other areas, but there are tons of unreserved camping spots, campers forming little compounds in the backstretch parking area, trailers huddled around fire pits and beer kegs. Others tuck their motorhomes in sheltered alcoves among the fair buildings wherever they can find space, then run extension cords and hoses to whatever outlets and spigots are available. I took this photo last Friday—those are electric cords running across the main entrance road and through a massive puddle. That probably exemplifies the Super DIRT Week spirit more than anything, that sense of, “I can’t believe they let us do this.” It still feels like 1978 there, where everything’s a bit of a free-for-all. Super DIRT Week has an atmosphere of affable chaos. It can be a little loud, but there’s also a strong sense of banding together against the rain and cold, sharing war stories and racing gossip around the campfire. Not that the place was perfect. When the track surface isn’t properly prepared, it became a one-lane parade where passing was nearly impossible. A few too many years were decided by fuel mileage. DIRT leased the fairgrounds from New York State, which meant they couldn’t make improvements to the physical site or control what the state did or didn’t do to it. New York’s stewardship ranged from benign neglect to what appeared to be outright hostility. For all its flaws, race fans in the northeast can’t believe Super DIRT Week is going away. Sure, DIRT plans to put on a Super DIRT Week somewhere next year. The announced home is Glenn Donnelly’s new Central New York Raceway Park, an ambitious plan that includes a half-mile dirt oval and a sprawling road course that could host SCCA events. But it seems unlikely that facility will be ready by next October, and not a single person I spoke to all weekend was excited about it. 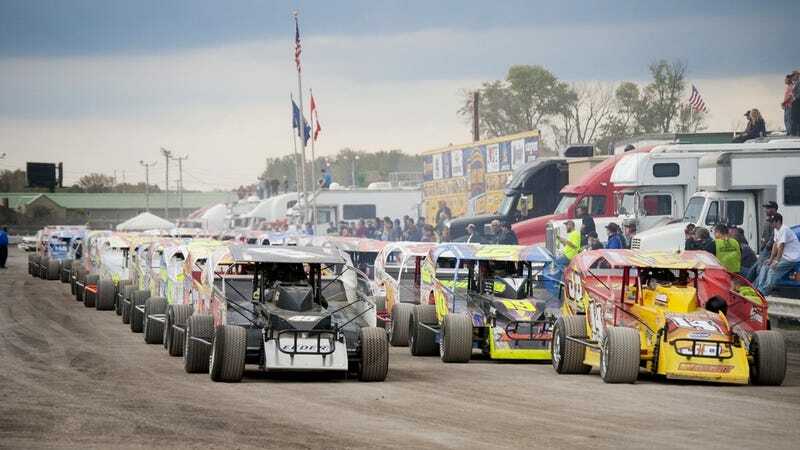 One proposed backup plan involves temporarily covering Oswego Speedway with dirt, which actually sounds pretty awesome. The part that’s hard to swallow is why the historic Syracuse track is being destroyed. Onondaga County Executive Joanie Mahoney apparently looked at the track and saw a place where people could put on “equestrian events” if only that damn race track wasn’t in the way. Governor Andrew Cuomo started funneling money into the county to build a new ampitheater, then tear down the race track to build... something. It’s the kind of vague plan that only means someone’s pockets are being lined, and the tangled web of kickbacks seems impenetrable. If I sound bitter, I’m not the only one. I went to my first Super DIRT Week in 1985. I’ve missed a handful over the years, maybe three or four, but for the most part I’ve sat in the same seats with my dad and brother, (who took most of the photos that accompany this article). It was an event we looked forward to. Around March we’d start talking about how we couldn’t wait for Super DIRT Week. By August my dad would be planning what food to bring and which side events we’d go to. It felt like it would always be there, like there’d always be a next year. It’s entirely possible that some health problems in my family right now are sharpening the point a little too much—I get it, universe, “This, too, shall pass,” but I think your metaphor is a little on the nose, ok? People have an emotional connection to Super DIRT Week because of the bonds they form there with friends and family. Here’s a picture of me that first year, in ‘85. Fans have had their ashes scattered on the track. My dad has said for years we should scatter his in turn one, a place that won’t exist in a few weeks. In my heart, that grandstand, certainly no architectural beauty, is deeply connected to my father and my brother, and I’m not the only one who feels that kind of connection. I’d assumed I’d keep going there for years to come, whatever else happened. It’s just a stupid place, a circle of dirt and concrete. All is impermanent. But I cried while writing this. As Stewart Friesen climbed the winner’s podium Sunday night, we all filed toward the stairways that wind down from the upper rows. I watched person after person pause and turn to look at the track before they headed down the stairs for the last time, and more than a few blinked back tears. Then I did the same thing. Looked down that long front stretch one more time. Looked out over turn one, the race-hardened dirt gleaming as the setting sun filtered through the grandstand. Then the flow of the crowd urged me forward, and we walked down into the twilight and left that place forever. Ed Grabianowski is an author and freelance writer. He’s worked as a contributing writer for io9, HowStuffWorks, and Sweethome, and his fiction has appeared in several publications. Ed took second place in David Wellington’s Fear Project.